St. Kitts and Nevis aren’t renowned as diving destinations, but snorkelers and scuba divers will find plenty of interesting sights below the waves, including a rare opportunity to dive on a black coral reef. Among the hundreds of shipwrecks around the islands are the freighters River Taw and M.V. Talata, which are popular sites. Sharks and turtles are relatively abundant and can often be seen on dives. For more information contact Dive St. Kitts (tel: 869 403 5966; www.divestkitts.com). Lofty Mount Liamuiga is a supposedly extinct volcano at the centre of St. Kitts (some believe it is merely dormant). Standing 1,156m (3,792ft), the mountain is covered in farmland at the foothills, rainforest in lower elevations and cloud forest towards the summit. A lake partially fills the 1,000-foot-deep volcanic crater, which can be reached by a series of hiking trails; the strenuous, two-hour climb is rewarded by panoramic views of neighbouring islands. There are many hiking trails leading into the mountains and through the islands' verdant rainforests. Local guides can be arranged through hotels, but experienced ramblers can tackle the trails solo. On St. Kitts, the summit of Mt. Liamuiga represents a popular challenge for hikers, while Nevis Peak offers a similar experience. Basseterre, the picturesque capital of St Kitts and Nevis, retains the flavour of both French and British occupation. The latter’s influence is felt most around Independence Square, which is surrounded by beautiful Georgian buildings. Although small – Basseterre has a population of approximately 16,000 – the city is the main commercial and industrial centre on the islands. It hosts regular markets, cricket matches and is home to landmarks including St George's Anglican Church, Basseterre Co-Cathedral of Immaculate Conception and The National Museum, housed in the Treasury Building. One of the best-preserved citadels in the Americas, Brimstone Hill is a defunct British fort and UNESCO World Heritage Site. Dubbed 'The Gibraltar of the West Indies,’ Brimstone Hill was built by African slaves during the 17th century and was the scene of a number of Anglo-French maritime battles. Surrounded by former sugar plantations, the fort commands splendid views across the limpid Caribbean waters and is home to a rich variety of flora and fauna including vervet monkeys. If you want to see St Kitts in style, get in touch with Sky Safaris (tel: 896 466 4259; www.skysafaristkitts.com). This adventure company operates an advanced network of zip lines, which take passengers on a high-adrenaline tour of the rainforest, whilst offering excellent views of sugar estates and the iconic fort at Brimstone Hill. Come on in, the water is lovely. 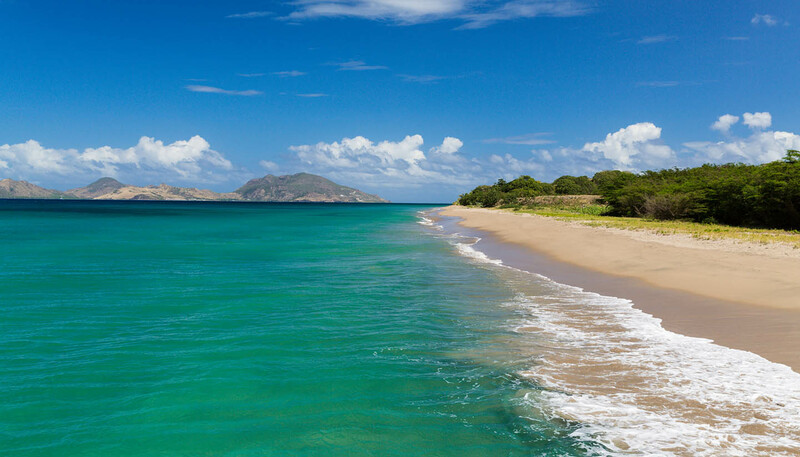 St Kitts and Nevis boasts some of the cleanest seawater in the Caribbean. The water is warm and mostly calm, too, which makes it great not only for swimming, but other watersports such as sailing, water skiing and deep sea fishing. Horse riding in the rainforest or along the beach can be arranged through various hotels and tour operators across the islands. The Nevis Equestrian Centre (tel: 869-662-9118; www.nevishorseback.com) organises romantic, sunset rides for adventurous couples. You can rent bikes on St. Kitts or Nevis, but Nevis is the more bike-friendly of the two islands, with less traffic, fewer hills and a 20-mile road circling the island. Nevis by bike is a great way to see the island at a comfortable speed; both St. Kitts and Nevis also have ample mountain-biking trails to explore. Flowering orchids and flamboyant bushes are among the visual highlights at The Botanical Gardens of Nevis (tel: 869 469 3509; www.botanicalgardensnevis.com). These pretty gardens incorporate a rainforest conservatory – modelled on Palm House at Kew Gardens in London – which is alive with butterflies and parrots. The on-site restaurant serves Thai cuisine at lunchtime and houses an art gallery devoted to the ‘first lady of Nevisian art’ Eva Wilkin. Completed in 1926, this narrow-gauge railway was originally used to transport sugar cane from the island’s plantations to a processing factory located in Basseterre. When the sugar industry was mothballed, the line was converted into a scenic railway (tel: 869 465 7263; www.stkittsscenicrailway.com). Tours begin in Basseterre and take approximately three hours, covering 18 miles by rail and 12 miles by bus. The picturesque route circumnavigates the island and takes in most of the island’s sites, including Brimstone Hill, Mount Liamuiga and some of the larger sugarcane estates. Four thousand years of human history on Nevis are detailed in the Museum of Nevis History in Charlestown. Housed in a Georgian style home, the museum's exhibits include pre-European artefacts, information about local conservation efforts, a timeline of the island's political history, as well as architectural and cultural information. The museum also celebrates famous local residents, which included Horatio Nelson and American Founding Father, Alexander Hamilton. The charming capital of Nevis is characterised by its wooden buildings, friendly ambiance and brilliant blooms of bougainvillaea. The town is peppered with historical monuments and attractions such as the Cotton Ginnery, Alexander Hamilton's birthplace (now a museum), the Court House, the War Memorial and the Jewish Cemetery. It’s also home to a number of old plantation houses which have been transformed into superb hotels and restaurants. Frigate Bay is the main resort area on St Kitts and boasts two fine beaches, numerous hotels, a golf course and a casino. Known as ‘The Strip,’ it consists of a series of popular beach bars and is the island’s nightlife hub. Frigate Bay North is home to a smattering of beach resorts and holiday homes, while Frigate Bay South is more popular with locals. Located north of Charlestown is Pinney's Beach, arguably one of the finest on the island. This expanse of silver sand, lined with palm trees and beach bars, is probably the most popular stretch of sand on the island. For something a little bit wilder, head further north to Black Sand Beach and Hurricane Hill, which offer stunning vistas across St Kitts and Barbuda. This 17th century former sugar estate is now home to Caribelle Batik, St Kitts (tel: 869 465 6253; www.caribellebatikstkitts.com), an artisanal workshop that produces vivid fabrics and fine garments for men and women. Visitors can take tours of Romney Manor, learning about the sugar and rum production process, and finding out more about the estate's previous owners, which include Sam Jefferson II (a relative of American Founding Father, Thomas Jefferson). Many of Nevis’ historic attractions are found along the road which circles the island. This road forms part of the official Heritage Trail, which takes visitors to the abandoned British citadel, Fort Charles, the Hermitage Estate, now a boutique inn, and a pair of Anglican churches (St. John’s and St. Paul’s). The Saddle Hill fortress, near Montpelier Plantation, is known locally as ‘Nelson’s Lookout,’ and is well preserved and worth a detour. The trail begins and ends in Charlestown.